The prevailing opinion by non-partisan pundits is this game will be a one-sided mismatch. And why wouldn’t they think that? The New York Giants are coming off a 3-13 disaster that saw them battle the Cleveland Browns for title of worst team in the NFL. The Jacksonville Jaguars are a cocky, up-and-coming team that led the New England Patriots 20-10 in the 4th quarter of the 2017 AFC Championship Game. The good news for the Giants is that in this league, the landscape often changes at the drop of a hat. While the Jaguars are a more fundamentally-sound team because of their strength in the trenches and depth across the board, the Giants appear to have some of the game’s premier game-changers. This game looks like the classic confrontation of the more staid, methodical, physical team versus the flashy, big-play-capable one. What these types of contests usually come down to is the ability or inability of the flashier team to erase the more physical team’s advantages by quick-strike scoring plays. In other words, Eli Manning, Odell Beckham, and Saquon Barkley have to prove they are worth the huge chunk of salary cap space they are being paid. Jacksonville is the better team across the board, but these three can be the great equalizer. What is the one thing that all defensive coordinators dream of? The ability to control the line of scrimmage with just your front four. Giants’ fans are well aware of the benefits of this type of defense (see the 2007 defensive front). And that’s the huge advantage that Jacksonville has and the primary reason why they are so good (2nd overall in 2017, 1st against the pass). Eli Manning, Odell Beckham, Saquon Barkley, Evan Engram, and Sterling Shepard. That’s some arsenal. But those guys may not be able to do their thing if the Jacksonville front four eats the lunch of a completely rebuilt offensive line. That offensive line struggled in the preseason to create room for running backs and had enough mental and physical breakdowns in pass protection to cause some to wonder how much a problem is this unit going to be yet again? The Jaguars are very good and deep across the entire front, but the match-up between DE Calais Campbell (14.5 sacks in 2017) and RT Ereck Flowers has to be particularly alarming. Jacksonville’s coaches also undoubtedly noted the issues New York had in picking up stunts and blitzes up the middle in the preseason. But again, the Jaguars probably won’t have to blitz much. Defensive tackles Malik Jackson (8 sacks) and Marcell Dareus are quite capable enough of presenting problems straight up for Will Hernandez, Jon Halapio, and former Jaguar Patrick Omameh. What about the left side? Even Nate Solder will have his hands full with defensive end Yannick Ngakoue (12 sacks). Jacksonville accrued 55 sacks as a team in 2017 (twice as many as the Giants). So if you’re Jacksonville, your game plan is pretty obvious: count on your front four to win their match-ups with the Giants’ offensive front, and have your back seven concentrate on Beckham, Engram, Shepard, and Barkley out of the backfield. What makes matters worse for the Giants is that Jacksonville has arguably the top corner in football in Jalen Ramsey – a guy who believes he can take Beckham out all by himself. What about Jacksonville’s linebacking unit? Weakside linebacker Telvin Smith was an All-Pro in 2017. They are strong at all three levels. One of the reasons they are so good is they get teams in 3rd-and-long, and then they are near tops in the NFL in 3rd-down defense. So what do the Giants do? 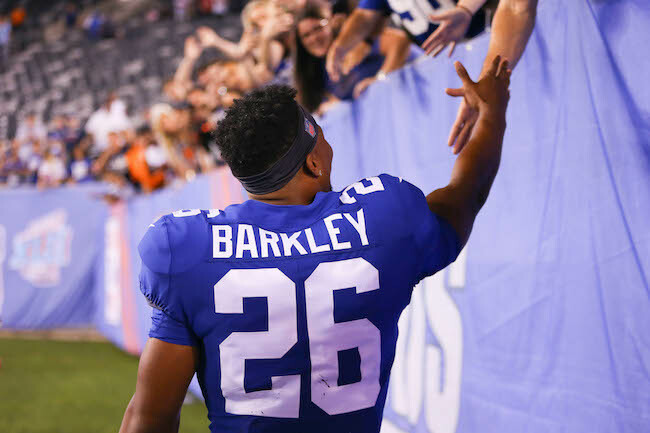 I would run, run, run the ball with Barkley. Jacksonville may have been 2nd in defense and 1st in pass defense in 2017, but they were also 21st in run defense and 23rd in yards per carry allowed (4.3). Running the ball will do a number of things for New York: (1) help keep Eli Manning clean and calm, (2) take pressure off of the offensive line, (3) keep the clock moving, (5) make 3rd-down situations more tolerable, and (6) enable Barkley – the guy the Giants passed over a number of quarterbacks for – to do his thing. Jacksonville had so little tape on Barkley that they had to go back and watch Penn State highlights. Run the ball. When you do pass, start off with the short- to intermediate-passing game to Barkley, Engram, and Shepard. Let Odell be the decoy early. Keep the chains moving and hope Barkley can break some big runs or catches (keep an eye on that wheel route). Most importantly, don’t turn the ball over. Jacksonville was 2nd in the NFL in 2017 in forcing turnovers (21 interceptions and 12 fumble recoveries). But at some point, if the Giants are going to win this game, Odell has to do his thing – either a big run after a short catch or a deep ball. The Giants will need a big-play score or two to win this game as they are not likely to consistently drive the field against this defense. This another easy breakdown. Everyone knows Jacksonville’s strengths and weaknesses on offense. It all starts and ends with stopping the run. Jacksonville was the NFL’s #1 running team in 2017 with over 140 yards per game. Workhouse running back Leonard Fournette’s stats are good (1,040 yards rushing in 13 games), but his yards-per-carry (3.9) doesn’t stand out. The thing is that Jacksonville sticks with the run. They attempt (and often succeed) in grinding you down by simply keeping at it. They literally run the ball half of all snaps – that’s as old school as you can get in today’s league. And just when you think you have a drive stopped, their quarterback Blake Bortles (322 yards rushing) will keep drives alive with his feet. The Jaguars won’t go away from what got them so far last year. They will run the ball. If New York can get them in 3rd-and-5 or longer, the the pressure will be on Bortles to pick up the first down with his feet or arm. Containment – something of an issue for Giants’ defenses in recent years – will be critically important. Keep Bortles in the pocket. Bortles probably will avoid Janoris Jenkins and focus his efforts against the Giants’ linebackers in coverage and Eli Apple. Bettcher can and will attempt to unnerve Bortles by bringing the kitchen sink after him. In response, the Jaguars will max protect and take their shots against Apple and the nickel corner. This year, the Giants will live and die by the blitz. Not having Olivier Vernon, the team’s best pass rusher, available will hurt. Oh boy! Who knows what we will get here? The special teams coordinator has cancer so Tom Quinn still is in the picture. The return game looked decent in the preseason but both returners were cut and Kaelin Clay was just picked off of waivers. And Shurmur is making noise that he won’t be afraid to have Odell Beckham and Saquon Barkley return punts and kickoffs, respectively. Misdirection or will Shurmur take more chances? Aldrick Rosas had a strong preseason but now has to prove he can keep it up when it counts. The problem in truly evaluating this game or this season is we really don’t know the mettle and true abilities of this Giants’ coaching staff and roster. This could be a very bad, average, or maybe even good team. Anyone who says he or she knows for sure is just bloviating at this point. Coaching makes a huge difference in today’s NFL. Shurmur is a retread who was fired in Cleveland, but many don’t believe he got a fair shake there. Is he the real deal or just another placeholder? Does Eli Manning – who is coming off two down seasons – still have it? Odell Beckham is a walking highlight reel but so far that hasn’t translated into many wins. Was Saquon Barkley really worth the #2 pick in the draft? Will the offensive line once again be the team’s Achilles’ heel? Can Bettcher really trust guys like Eli Apple, Curtis Riley, and B.W. Webb enough to bring the kitchen sink? The Giants’ special teams were undoubtedly the worst in the NFL last year across the board. Can they at least reach middle-of-the-pack status? So many questions. As for this game, the Giants can steal a win here if they protect the football and Beckham and Barkley can hit the home run. But this is a very difficult opponent to start the season with.